Friendly City Food Co-op is turning five years old. And like any five-year old, they want to have a BIG birthday party – and you’re invited. The co-op was just an idea back in 2006, when a small group of community members started a conversation about creating a full-scale natural and organic grocery store that would put a premium on using local farmers and producers. 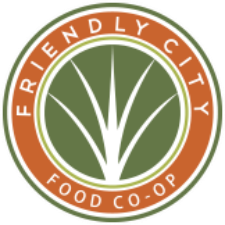 After several years of planning, effort and dedicated fundraising, Friendly City Food Co-op opened its doors on June 6th, 2011. A co-op, or a cooperative, is a business based on community and sustainability. It’s about using profits to make a difference in the community and the world. Co-ops strive to be good stewards of the environment, wasting little food and supporting local farmers and vendors whenever possible. To celebrate, come out on Saturday June 4 between 11am and 4pm. There will be live music- including duo Bryan Elijah Smith and Jay Austin, kid’s activities by Larkin Arts, food trucks, a bouncy house, prizes, a photo booth, free samples and gift bags for the first 250 people to attend. The event is free to the public. Visit friendlycity.coop/harrisonburg-events-classes/ for information.